HERE IS A LIST I COMPILED FOR A FRIEND WHO IS A LEADER, DOING A WORKSHOP ON INTERCESSORY PRAYER, MOSTLY FOR FOLK IN A MAINLINE PROTESTANT CHURCH. SHE’S QUITE FAMILIAR WITH THE MORE CONTEMPLATIVE SIDE OF SPIRITUALITY, BUT NEEDED SOME MORE FOUNDATIONAL STUFF ON PRAYER. THOUGHT I WOULD SHARE WITH YOU WHAT I WROTE TO HERE. ENJOY. Thanks so much for this fabulous inquiry…we love offering suggestions about important books and are so glad you wrote. Of course we know that you know your way around this topic, we surely don’t expect you to want all of these, but thought it would be fun to let you know about them. Sorry I got carried away. Of course, just for the record, we both know that prayer and a prayerful lifestyle, includes more than intercession. You know we handle oodles of books on spirituality, the classic spiritual disciples and practices that enhance our contemplative experiences, centering prayer, deeper intimacy with God, the work of Christ-like formation and reflections upon our inner lives. I haven’t listed any here any standard spirituality books, but rather, just those more generally on prayer, and more specifically, on intercession (or those that have good sections about intercession.) I didn’t list any more books about healing ministry, since you have a few (I still love the wise and modest Stretch Out Your Hand by Tilda Nordberg and Bob Webber from Lancaster Seminary and of course Fr. McNutt’s Healing is a classic) but do let us know if you want any ideas in that arena of intercession or on ministries of healing prayer. Thanks again. Prayer: The Cry for the Kingdom Stan Grenz (Eerdmans) $14.00 This expanded edition has a forward by Eugene Peterson and is a fabulous, serious-minded reflection, for personal and communal praying. Very thoughtful, perhaps not for beginners. It brings to mind the one by the UCC scholar Donald Bloesch, The Struggle of Prayer, which is sadly out of print. Prayer: Does It Make a Difference? 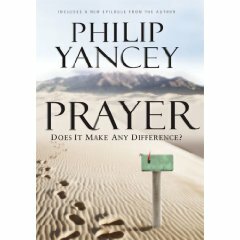 Philip Yancey (Zondervan) $21.99 In lesser hands, this would still be a fabulously interesting book, but with Yancey’s graceful and honest style, it has become a well-respected study of what is really going on when we pray. Powerful, fresh, elusive, insightful and important. Praying: The Rituals of Faith Lucinda Mosher (Seabury) $16.00 This is from the remarkable series called “Faith in the Neighborhood” which attempts to develop inter-faith sensitivities by seeing how different faith traditions “do” various spiritual practices. (For instance, there is one on grief, one on belonging, etc.) This is for anyone with an ecumenical heart, or who may be involved in interfaith coalitions. This encourages even shy Christians to talk to their neighbors about prayer and their own religious practices. Nice. The Prayer: Deepening Your Friendship with God James Houston (Victor) $16.99 This is one of a magisterial and profound five-volume series called “The Soul’s Longings.” Maybe a tad deep and dry, it is still wonderful, meaty, and important work written by a scholar who knows the Catholic medieval, Reformation, and Puritan literature, C.S. Lewis and all the rest. What a great gentleman, teacher and author, offering here a very thoughtful book helping us learn that prayer isn’t a dreary exercise or a difficult skill, but a way to be friends with God, shaped largely on how we perceive God. Very Scriptural, theologically aware and yet wisely pastoral. Houston helped start the DC-area C.S. Lewis Institute, and was a major influence at Regent in BC for years. Very important. The Heart of Prayer: What Jesus Teaches Jerram Barrs (P&R) $14.99 Barrs is a conservative, Reformed evangelical and I think this is one of the most solid explorations of prayer I’ve seen. It shows, too, how prayer is essential for a graceful life of discipleship, how God understands our weaknesses, and how we must be honest about our need to improve our prayer habits. Thoughtful and wise and highly recommended. The God Who Hears W. Bingham Hunter (IVP) $16.00 This includes reflections on all the best questions—are faithful prayers always answered? Does prayer change God’s mind? How can I be close to an invisible God? And how to do it, pray regularly and faithfully and effectively? Poet Luci Shaw writes “Though I’ve prayed all my life I needed the fresh, refreshing thinking and writing that I found…Hunter has opened up God’s heart and turned my understandings of dialogue with him upside down.” Fairly short chapters and great discussion questions make this perfect for personal study or small group conversation. Lord Teach Us To Pray Alexander Whyte (Regent College) $24.95 Eugene Peterson has often raved about this deep study by the renowned Scottish preacher. Learned and yet imaginative, this is a series of sermons he preached in the winter of 1895, rooted deeply in various Biblical prayers. Daring to Draw Near John White (IVP) $15.00 (regular sized) or $10.00 (slightly edited, smaller sized) This is one of my all time favorite books on prayer, a study of pray-ers and their prayers in the Bible. What we can learn about God and the diverse sorts of prayers that Bible characters prayed! I’ve been highly recommending this for 30 years! Great Prayers of the Old Testament Walter Brueggemann (Westminster/John Knox) $16.95 Because of my love for the John White book, I can’t wait to get into Walt’s great-looking study. You can imagine the rich language, the thick Biblical study, and yet this is readable, designed for adult ed classes or small groups. Well worth the time, I’m sure. Prayer: Finding the Heart’s True Home Richard Foster (HarperOne) $23.95 Oh my. Although not all of these styles or methods of praying are intercessory, many are, and I cannot say enough about this moving sequel to the extraordinary 20th century classic, Celebration of Discipline. It is truly one of my all time favorite books, and nearly anyone can relate to at least some of the many chapters, each offering a different way to pray. Inspiring, reflective and yet very instructional and helpful. Wow. You might want to know that this is available in an audio-book form, in CD. 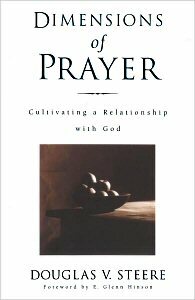 Dimensions of Prayer: Cultivating a Relationship with God Douglas Steere (Upper Room) $12.00 While much of this is gentle, deeper spirituality informed by Steere’s reflective Quaker perspective (it is no surprise that Tilden Edwards and Parker Palmer have endorsements) it also has some truly wise insights about intercession and the cost of praying for others. Very, very nice. Pray With Your Eyes Open: Looking at God, Ourselves, and Our Prayers Richard Pratt (P&R) $12.99 Pratt of course means to keep our eyes open to the needs around us, but even more, suggests that since we are talking to God, we need to know about God, God’s attributes and characteristics. There are charts and diagrams and teaching devices here that walks the reader through substantial Reformed theology regarding God and our role in praying for others and ourselves. The Life of Prayer: Mind, Body, Soul Allan Hugh Cole (Westminster/John Knox) $16.99 This seminary prof from Austin has written about raising boys, grief and other pastoral concerns, and here gives a brand new, very practical and discerning book. Phyllis Tickle says it is “the most complete tutorial on the basics of Christian prayer I have ever seen.” That speaks volumes in my book, and hope to study it soon. Too Busy Not to Pray Bill Hybels (IVP) $15.00 Many have said this is the best book they’ve ever read, many more say it is the best book they’ve read on prayer. It is accessible, clear, and oddly moving, calling us to slow down and draw near to God. It is challenging and comforting, inspiring and helpful. A must for beginners, and a great way to refresh your commitments. Mavelous. Prayer O. Hallesby (Augsburg) $7.99 This little gem is a 20th century masterpiece, a world-famous classic to enrich and deepen your prayer life. This edition has a study guide making it ideal for study groups or adult ed classes. 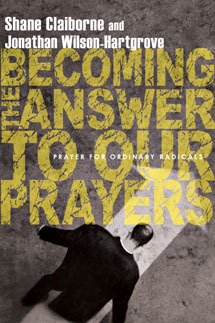 Richard Foster did the forward, saying that the book itself “breathes prayer…a book full of grace and mercy, jubilee and challenge.” A must-have resource! Simple Ways to Pray: Spiritual Life in the Catholic Tradition Emilie Griffin (Sheed & Ward) $19.95 This author is well known among liturgical folks and those who read widely in contemplative spirituality. (You may know here Clinging which, although out of print, is a classic.) This is such a sweet and practical little guide, including classic prayers, tons of ordinary information, helpful overviews of many approaches to prayer. Her insight about different techniques, styles, and types of praying is really helpful. Mighty Prevailing Prayer Wesley Duewel (Zondervan) $14.99 It is hard to do a list of books on prayer without listing Dr. Duewel, a passionate leader of intercessory prayer. He has written about prayer in the cause of world evangelization (Touch the World Through Prayer) and is a serious practitioner! He covers how to have greater faith, how to have perseverance, the prayers of agreement, fasting, etc etc. A deeper level work by a thoughtful and zealous evangelical. Prayer Power Unlimited J. Oswald Sanders (Discovery House) $9.99 Sanders was from New Zealand and wrote the famous devotional My Utmost for His Highest. Here, he offers great insights about intercession, knowing God through prayer, resisting disillusionment, struggling with questions of God’s sovereignty, and how to be a deeper, more fruitful prayer warrior. He discusses five characteristics of balanced prayer, including some practical application lessons. I think the somewhat goofy title belies a very wise little book. 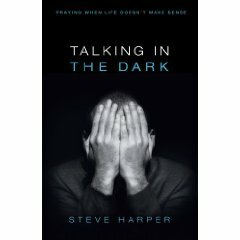 Talking to God in the Dark: Praying When Life Doesn’t Make Sense Steve Harper (Upper Room) $13.00 I trust Harper very much, and this slim book is faithful, honest, real. He acknowledges his own struggles with prayer and has a very helpful section on praying for others, and praying for yourself. I’m so glad there is a resource like this and hope that pastors and spiritual directors give it out often to those in dry or frustrated or hurting places…ask me about Michael Card’s books on lament, too, on this theme…very helpful. Letters to Malcolm: Chiefly on Prayer C.S. Lewis (Harvest) $13.00 Well, why not list this–Lewis was a wonderful correspondent and his letters are always fascinating, amusing, and often quite poignant. Here he offers timeless, friendly advice, mostly on praying. A Simple Way to Pray Martin Luther (Augsburg) $16.95 This little letter, written by the great reforming priest to his barber, Peter, is often cited. This small hardback has a sweet forward by Marjorie Thompson (Soul Feast) who notes that it is a childlike treatise. Serious and yet so understandable and simple. (NavPress) $10.00 The founder of Pray magazine, this emerged from his work with a network of church-based prayer leaders. Particularly helpful is his identification of obstacles to serious prayer work. Very useful. Intimate Intercession: The Sacred Joy of Praying for Others Tricia McCary Rhodes (Word) $14.99 The great writer and pastor Mark Buchanan says “This is a great book on prayer for the simple reasons that it actually makes you want to pray.” My, my, this is great writing, interesting and elegant and creative and lovely. I suppose it is marketed more to women with the nice flowery cover, but I seriously recommend it to anyone with a heart for intercessory prayer. 7.97.) As a late 70’s 20-something, I viewed it as a bit too staid, until Richard Foster insisted it was one of the best books he ever read. If it shaped Richard, that is something, eh? Together in Prayer: Coming to God in Community Andrew Wheeler (IVP) $15.00 This is a resource to help small groups think about prayer, and actually pray, together. This is a rare kind of book, and will be very useful for leaders or anyone wanting to learn to intercede together. The Prayer-Given Life Edward Stone Gleason (Church Publishing) $12.00 As we all know, Episcopalians use their prayer book—The Book of Common Prayer–which has marvelous resources for intercession. This is a hymn to the power of the prayer book and includes stories and testimonies and reflections. For those with a more eucharistic theology or liturgical yearning, this is a wondrous study of formal prayer. Praying With the Church: Following Jesus Daily, Hourly, Today Scot McKnight (Paraclete) $15.95 McKnight is a well-known progressive evangelical scholar and here he gives helpful chapters on how the Orthodox pray, how Roman Catholics pray, how Anglicans pray, and why even non-liturgical folk might want to explore the liturgical practices of communions that stem back to the earliest church. He studies Jesus’ prayers, and moves into the use of the Divine Hours. In Constant Prayer Robert Benson (Word) $17.99 This is in the “Ancient Practices” series which I have blogged about on occasion. This is the most eloquent, yet simple, telling of the story of “fixed hour” prayer I have seen. Very beautiful and very moving. Praying for Dear Life: A Reason to Rise, Strength for the Day, Courage to Face the Night Thomas R. Steagald (NavPress) $12.99 A conversational writer of great skill (he’s got endorsing raves from Frederick Buechner and Lauren Winner) he tells of his own spiritual practices, his hobbled-together times of daily office and why this United Methodist pastor prays as he does. I loved this book and really wish we could promote it widely! Lord Have Mercy: Praying for Justice with Conviction and Humility Claire Wolfeich (Jossey Bass) $21.95 This is in the renowned “Practices of Faith” series and each chapter narrates a story of prayer for some aspect of social justice and global peace. It is surprisingly complicated stuff, learning to not use prayer as an ideological weapon, and the stories are really illuminating (do you pray for or against a war, the death penalty, abortion, or whatever…) This is careful research on six examples of modern Christians involved in social engagement and humble prayer served them. A rare sort of book, ideal for those with these concerns. By the way, the Roman Catholic activist James McGinnis just released a lovely little handbook for global intercession, country by country, called Praying for Peace Around the Globe (Ligouri; $10.95.) Perhaps that might be a helpful resource. The Power of a City at Prayer: What Happens When Churches Unite for Renewal Mac Pier & Katie Sweeting (IVP) $12.00 This may be a bit too evangelically-minded for some (the Brooklyn Tabernacle pastor Rev. Jim Cymbala and charismatic leader Che Ahn, have endorsements.) But so does the Honorable Rev. Floyd Flake (retired African American congressman, social justice advocate, and pastor of Greater Allen AME Cathedral in NYC.) Urban missions leader Ray Bakke has the forward, illustrating that this is a wholistic and culturally-engaged resource, telling of a large prayer gathering, interceding for New York and her churches. Can pray change a city? Who knew NYC had such a splendid past of hosting ecumenical prayer gatherings? Jonathan Wilson-Hartgrove (IVP) $13.00 I deeply respect the zany servants of the poor that these two young activists are, but who knew they are guys of deep prayerfulness, who understand the desert fathers and mothers, the mystics and monks–and know how to apply them to the fast-paced and urgent world of today? They really are wise, here, informative, inspiring and reminding us that God uses us even as we respond to our own prayers, in obedience and action and care. We can’t say enough about this, often suggest it, for those who desire passionate discipleship, social action, and who know that prayer should be at the heart of all public witness and struggle. Very highly recommended!